Description: Soft, tufted, deep purplish red fronds, to 300 mm long. Main axis well-defined, bi- or tripinnate, bearing alternate, distichous branches. 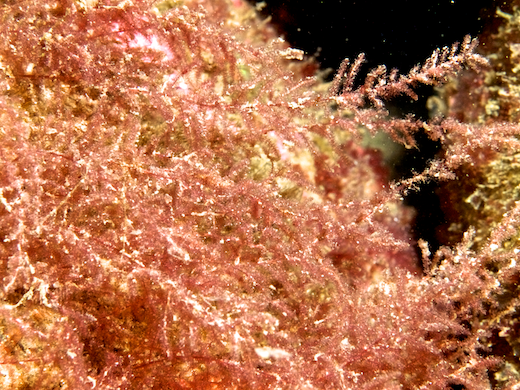 Branches and branchlets articulated, with central siphon and 5-7 pericentral siphons, clothed with short, slender, repeatedly dichotomously branched, monosiphonous ramuli. Habitat: On stones and shells and epiphytic, rare in lower intertidal; common in subtidal, spring and summer, widely distributed, common. Site © M.D. Guiry 2000 - 2019. Important copyright notice: all text, design and photographs on this site are copyrighted by M.D. Guiry unless otherwise stated and all rights are strictly reserved. Click here for copyright information and contact. Website design: 249 Design Studio. Site maintained by M.D. Guiry (michael.guiry@nuigalway.ie). There have been 8736751 page loads since 1 January 2014 on 25 April 2019.